Prices for the West Texas Intermediate gained traction on Tuesday and rose above $75 per barrel but failed to hold above that level amid reports from Reuters about a continuous decline in Iranian Crude exports. Over the next 24 hours investors will be focusing on the EIA and API reports on US oil stockpiles to compare them to the rising demand in this tightening market. As expected, US oil prices returned to retest the purple trend line after it was penetrated but did not cross above it. 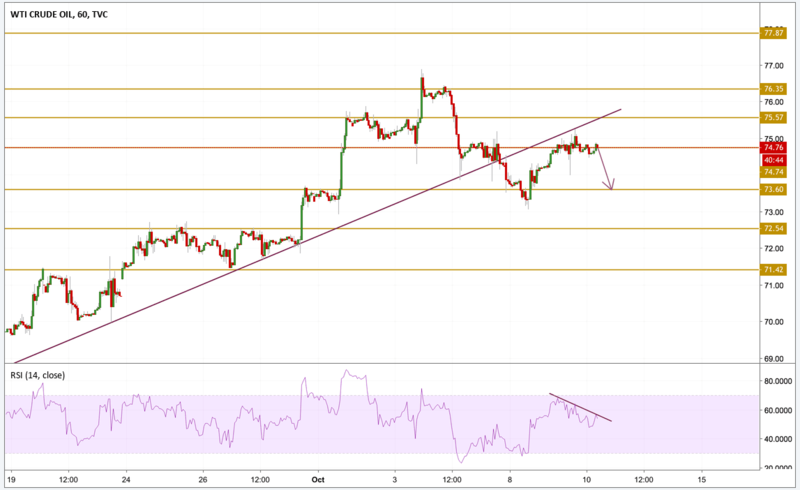 The price is currently hovering below the important $75 level with a declining momentum as the RSI points out. With a steady price movement and a declining momentum, the next move will most probably be to the downside and we will be focusing on the $73.60 support level.